The bridge crossing ceremony at Ampang's Nine Emperor Gods Festival was held on the 8th day of the festival. This ceremony is a symbolic act of crossing over obstacles and difficulties represented by crossing the bridge. 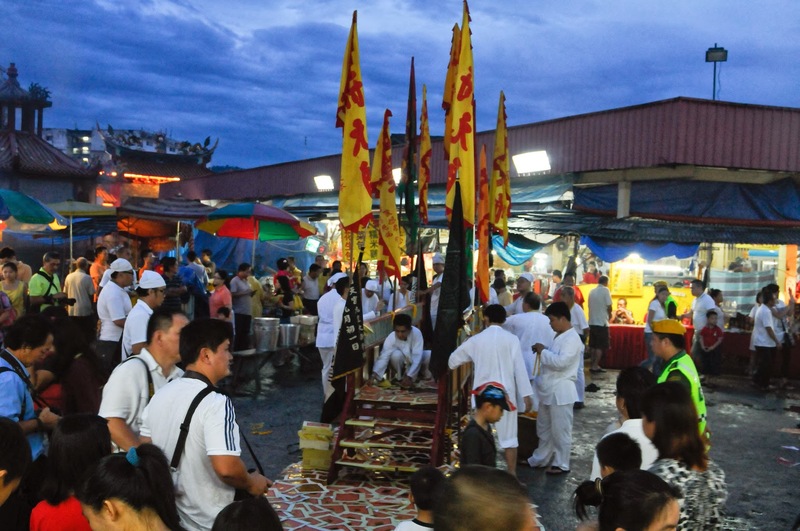 Buckets of water are placed underneath the wooden platform bridge to represent water or Yin element, and seven oil lamps are placed underneath the bridge as well to represent the Big Dipper stars. A shot of the bridge being prepared for the ceremony. 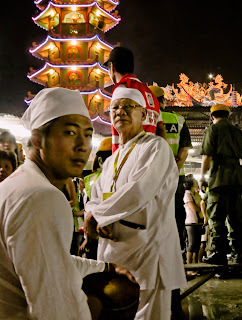 This is one of the test shots from a time-lapse project that I am involved with Cheryl Hoffmann, who blogs about Nine Emperor Gods Festival. Looking serious and solemn during the ceremony. As this year's ceremony falls on a Saturday night, the turn-out was great and many people patiently lined up to cross the bridge. 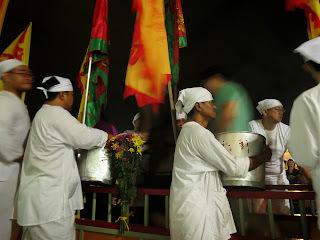 On the bridge, members of the temple manned donation buckets, the token for being allowed to cross the bridge and also an act of casting away whatever that is a burden for the person crossing the bridge. Buckets for donation as one crosses the bridge. We managed to cross the bridge halfway through the ceremony, and I must praise the temple staff and volunteers for keeping the crowd in an orderly fashion and facilitating the aged in crossing the bridge. There were some that didn't manage to cross the bridge, as the ceremony was already too long, and had to be stopped. Well, there is always next year. 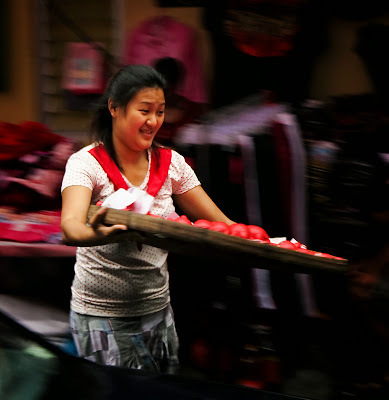 The only time when the tortoise is faster than the hare - due to the large crowd, the tortoise bun sellers were doing brisk business, with this seller rushing to bring more buns in. Tomorrow (the 9th day - 13 Oct) there will be a fire walking ceremony. Those who wish to see this event are reminded to come early, as the space available for viewing are limited. First time dengar tortoise bun. Meriah.